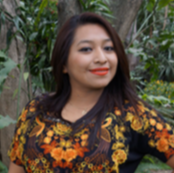 Evelyn is originally from Palín, Escuintla and was selected as a GOJoven Guatemala Fellow when she was 20 years old. She works with the Women’s Association and talks to young people about sexuality and STIs. For Evelyn, it is important to strengthen her knowledge on the topics of Sexual Health and Reproductive Health because there is still lack of information about these topics in society and thus taboos and myths still exist. Evelyn collaborates with groups from the Conjuve municipality in Palín to further the social development of young people in citizen participation and is currently serving as a teacher of Intercultural Infant Education.